Elvira has completely consumed me. I just can't stop thinking about her. All I want to do is sit down with her and knit. I am determine to finish this project before the month is over and I have a feeling that I'll be able to get it done sooner than planned. Even though the pattern and the stitches are super easy, I was still managing to screw it up every 3rd row. And I discovered that the "extra stitch" that I would sometimes get at the end of some rows wasn't an extra stitch after all. It was actually me forgetting to either yarn over at some point, or I had knitted an extra 'k2tog'. This isn't a pattern in which you can forget it and just add an extra stitch here and there, cause the eyelet design can look severely demented. So I would always go back and fix it. It seriously feels like for every 3 rows I knit, I mess up on at least one of them. I think this top would have been completely knitted up already if I just paid more attention and not screw it up so much. I finally figured out the joining of the back part too. I did what I thought was right, and at first I second guessed it cause the join looked very loose. But after a few more rows the join looked ok. I still might go over it with some scrap yarn at the end to tighten things up a bit. 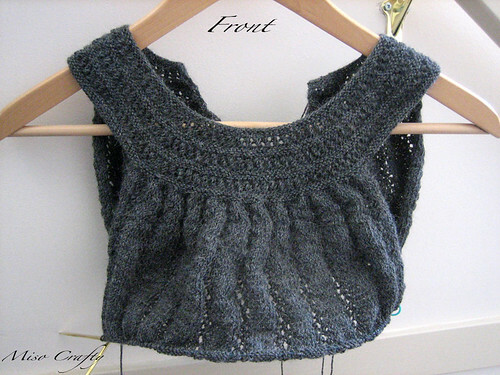 I might also have to do that with the eyelet pattern at the bottom of the armholes too. One of the sides look very loose, while the other looks fine. At one point I somehow managed to drop the working needle and drop what I thought was one stitch. After some calculations and knitting a row, I discovered that I had actually dropped 2 stitches! Yeah, I did a lot of cursing. And of course those dropped stitches just happened to be in the eyelet part, and so I spent a good portion of time trying to fix it. It looks like crap, very noticeable...to me of course. I'm hoping that since it's in the back and where my hair would technically fall over it that maybe no one will notice it. I'm also hoping that by the time I finished knitting this that I will forget about it. I put a stitch marker on that part, don't ask why, especially if I want to forget about it. But so far, I have to say that it doesn't look that bad. And if I block that part a bit I'm sure it'll all work out. You can see in the photo above where I marked the botched up spot. Don't ask why I'm telling you this either. At the moment the top looks a bit on the smaller size, which is weird considering that this is the medium. But when I tried it on it had fit perfectly. I think if the band was any wider it would fit funny on my petite shoulders. For a while there I had thought that the design in the top band wasn't that noticeable, not like in the photo of the pattern. But I think after I get some weight at the bottom of it, the top band will stretch out a bit and show more of the hole-y design. I did a dance of joy 2 days ago when I finally got to the underarm part. I knew that once I got the front and back joined up that I would be on the home stretch. Like the Thermis project, I learned a new way of casting on stitches. 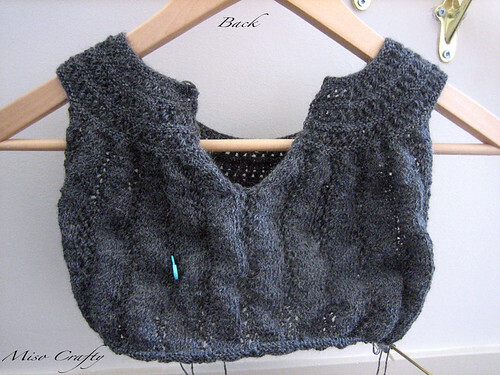 On Thermis I learned how to do a backwards loop cast-on for 4 stitches, on Elvira I learned how to do the cable cast-on for the armholes. The latter is definitely a nicer looking and tighter, yet still stretchy, kind of cast-on. Yay for learning new things! And so, all that is left is knitting up the rest of the body to the length I want, then finishing up the hem. I would like to say it's easy peasy from hereon in, but knowing my luck, I'll probably find a way to mess up royally somehow. Not to mention that I'm still working with teeny, tiny yarn here. Which means working up a few rows takes me a while. But that might change now that I'm working in the round and don't have to do anymore purling! Woot woot! I'm keeping my fingers crossed that by the time the weekend is over, I'll be able to say that I'm almost, if not completely, finished!! Wish me luck! 'Til then, happy knitting! On another topic, are you going to the knit nights in town still and do you know of any sewing groups that get together? Thanks!! With all the time and effort I've been putting into this top, I'm hoping it'll look good by the time it's done! I still go to knit nights. I've been able to go to the Tuesday nights for the past month now, as well as the Fridays. I think I'll be able to go to both for 'til at least the end of August...or whenever school starts up again. When are you going to be able to make an appearance? I don't know of any sewing groups that get together. When I first moved to Victoria I looked for some, but didn't find any. I thought about starting one up, but I think it would be a little harder trying to find a place that'll allow a few people to bring sewing machines and such without having to spend a load of money for the space! I hope to be able to finally make it to a meeting this summer before my hubby starts overtime and school again. My problem is that I don't have any knitting projects on the go right now, once I get one going I am there. All my money has been going to material, so the wool dept is sadly lacking. What's the best night to go on - tues or fri? I would love to make it soon, but can only make one night and would love to be able to meet you. I hope you do get the chance to make it to a knit night! As for what night is good really depends on what you prefer: Tues is usually quite busy with about 10-15 ladies knitting away. Fri is always low-key and lately there's only been a handful of us there. Once in a while we get double digit attendance. Once summer is over I'm going to have to choose which night to stay with since my partner's workload will pick up when school starts up again. So for now I'm being spoiled by being able to go to both nights. I'm guaranteed to be there on Fridays and it's only sheer luck that the past 6 weeks I've been able to attend the Tues one. When you can make it out let me know, I would definitely love to (finally!) meet you!